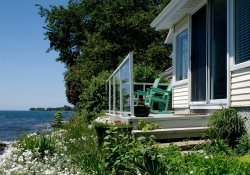 Plein Air is a private, newly renovated 3 bedroom, 2 bath bungalow perched on the edge of Lake Ontario. It is situated at the end of a quiet street with spectacular water views enjoyed from all areas of the house. The air-conditioned house provides a simple sophisticated atmosphere in which to relax and unwind. Although completely secluded, the house is within easy walking distance to the cafes and shops in Wellington including a grocery store. The Great Room features a vaulted ceiling with exposed beams and is surrounded by windows taking full advantage of the water views. Comfortable furnishings, a gas fireplace, 40 inch TV and current best sellers ensure you can relax the way you wish. The fully equipped kitchen is open to the great room and features high end appliances to make entertaining easy and enjoyable. All 3 bedrooms offer exposed beams, lake views and queen size beds. The master bedroom has a 3-piece ensuite. There is also a shared 4-piece bathroom off the central hallway. Bed and bath linens are supplied. Plein Air offers lovely decks and patios where you can enjoy drinks, dinner or lounging with breathtaking views. Limestone steps take you down to the water's edge where natural rock slabs are perfect for sunbathing or swimming. The side lawn offers an area to do yoga or play bocce or croquet. Stroll along the main street in Wellington for a coffee at The General, dinner at East and Main or a drink at the Drake Devonshire. Drive to the sandy beaches of Sandbanks Provincial Park or cruise the back roads and visit the many markets and wineries throughout Prince Edward County. Available for 7 night minimums in July and August only. Provincial Park Pass for one car is included with your rental. We had the most relaxing time. The panorama of the lake is unbeatable! We had a wonderful honeymoon here! Thank you - it is a beautiful and relaxing home. Available for 7 night minimums in July and August only. This property is located in the town of Wellington but offers seclusion and privacy. Breezes from the lake offer cooling. There is no Air Conditioning at this property. Very close to many VQA Wineries. Walking distance to the Drake Devonshire Hotel, East & Main and the The General.